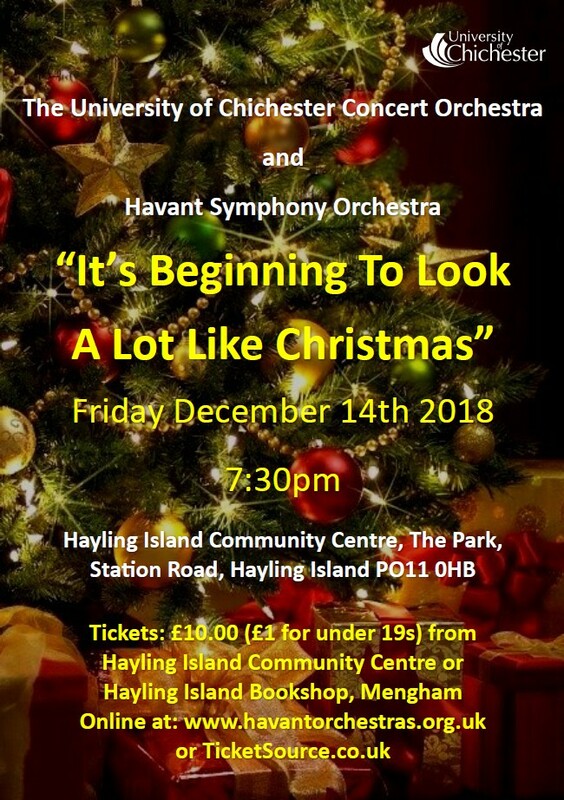 This is an edited version of the Havant Orchestras newsletter which is provided in printed form (or e-mailed in PDF format, if requested) to players and Friends of the Orchestras. With the recent centenary of the armistice that ended the first World War, there has been a strong focus on the events of those times. On November 4th, there was a special commemorative service at Havant Symphony Orchestra’s rehearsal venue, St Faith’s Church Hall at the Pallant Centre in Havant, with participation from various user groups, including a string quartet of HSO players joining in with the hymns. The service was also to celebrate the completion of the first phase of refurbishment work on the hall itself, which is also nearing its centenary, and the other Pallant Centre buildings. The improvements include new kitchen facilities and toilets, and should significantly improve the usefulness of these excellent community facilities. The English works in our HSO concert also date from around the first World War. Around that time, Holst and Vaughan Williams were making efforts together to define an English identity in music, in particular by looking back to folk music and Cecil Sharp’s initiative to collect and preserve it. Elgar similarly looks back rather nostalgically to the past in arranging Handel’s baroque overture for a large symphony orchestra. Ravel’s piano concerto is from a few years later, and is more forward-looking, heavy influenced by Ravel’s encounters with jazz in the USA, but there are still connections with England, in that Vaughan Williams studied with Ravel for a short time, and Ravel later said that the opening theme for the concerto came to him on a train journey from Oxford to London. 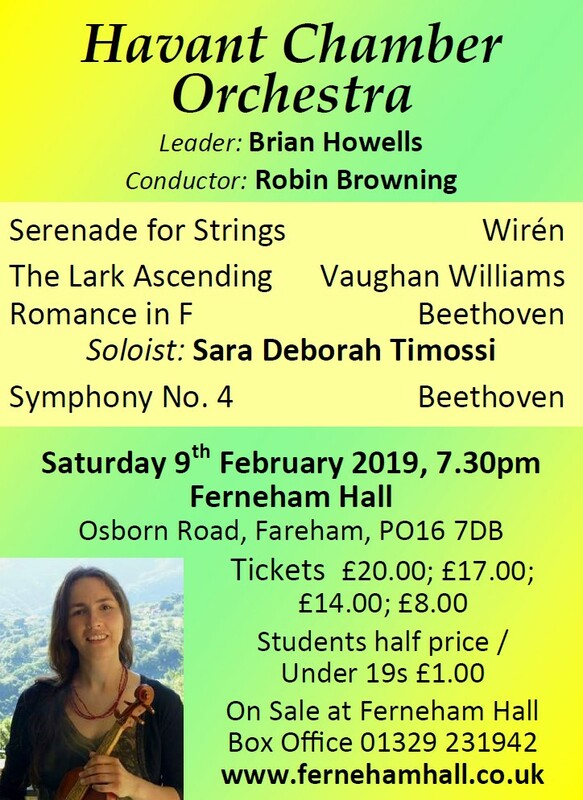 We hope to see everyone at our concert on Saturday, but also see below for future events, including our March concert to celebrate Peter Craddock. We wish you a safe journey home. 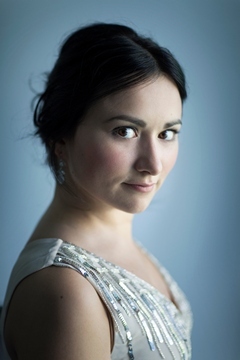 Our soloist Dinara Klinton will be talking to Stella Scott about the Ravel Concerto. We recommend taking seats at or near the front so that you can easily hear the speaker and musical excerpts. If you miss the start, please feel free to enter quietly. Welcome to our new Season! Now, if I was lucky enough to choose my Desert Island Discs for the, long running, BBC Radio show of the same name, I am pretty sure that the atmospheric London Symphony by Vaughan Williams would be on my list. I have conducted it many times and what is a particular thrill for me is that I have conducted it standing on RVW’s own and rather special podium at the Dorking Halls in Surrey, where he was the Festival Conductor of the Leith Hill Music Festival for getting on for 50 years! RVW was a well-known and much loved figure in the town of Dorking and, if you haven’t visited Leith Hill Place, only a short drive from Dorking town itself, it is well worth a visit. Leith Hill Place is where RVW spent most of his childhood and where he must have been inspired by the stunning views out across the Surrey countryside. The Place is now owned by the National Trust, so its future is well and truly secured (thank goodness) and one of the special treats of a visit there is to sample the delicious home-made cakes etc. on offer - made by the Friends of LH Place. Long may that continue. A walk up near by Leith Hill itself and the Tower is a bonus where, on a good day, you can see, to the South, the English Channel and, to the North, London and landmarks such as Canary Wharf and The Shard. Neither of which, of course, were built or even thought of in Vaughan Williams day! 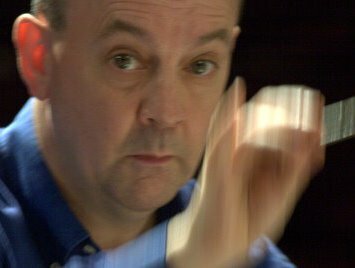 The London Symphony doesn't follow a particular story or programme and RVW disliked disclosing any possible hidden meaning in his works, leaving the listener to imagine what he or she wishes or to simply enjoy the music. But there are obvious references to London and its many sights and sounds – such as the Westminster chimes (heard right at the beginning of the Symphony), a barrel organ and street urchins in the Scherzo, perhaps whistling some well-known children’s song? However – for a performance in 1920 RVW allowed the conductor Albert Coates to suggest that the Allegro risoluto, which comes after the 1st movt. introduction, might represent Hampstead Heath on an August Bank Holiday (and is there perhaps a reference to ‘have a banana’ from the popular song ‘Let’s all go down the Strand’ – written a few years earlier?). Actually Vaughan Williams himself suggested that the slow movement is intended to evoke Bloomsbury Square on a November afternoon but he was adamant that he wanted this, his 2nd Symphony, to be thought of as ‘absolute music’. The work is dedicated to George Butterworth, who was tragically killed (far too young) in World War 1, before he could really make his mark on the musical world, ’though he did leave us a number of gems. Given that 2018 marks 100 years since the signing of the Armistice, RVW’s dedication is, I feel, particularly poignant. So why the Handel/Elgar Overture? Well, to start with it’s a great opener, plus it very neatly uses most of the extra instruments used in the Symphony. But my personal connection goes back to my teens, when I played in the Croydon Symphony Orchestra, conducted by the formidable Arthur Davidson. This Overture was one of his favourites and it seemed to crop up in programmes rather too often! I love it too and it’s also a brilliant piece of orchestration on Elgar’s part. Our Concerto is the ‘other one’ by Ravel – we played his Concerto for the Left Hand last Season, as many of you may remember? RVW studied with Ravel, so there is another neat connection as well. 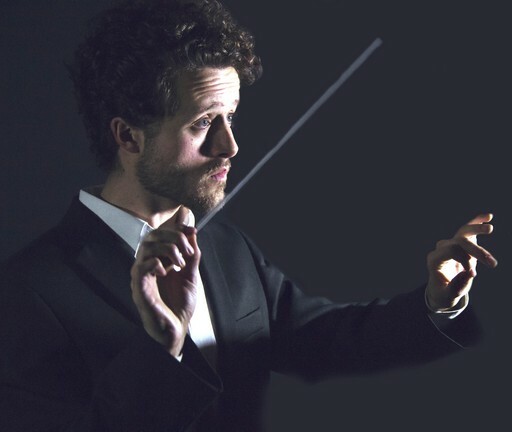 The Concerto’s three movements are wonderfully contrasting, the second being overwhelmingly beautiful and subtle and the third being a sort of musical fire-cracker – a virtuoso piece for almost everyone – not just the soloist. Nationalism is a concept that conveys greatness, heroism and patriotism. But sometimes nationalism can be also expressed in a completely different and unexpected manner. By 1903 Cecil Sharp, the founding father of the folk-song revival movement, moved to Somerset and undertook a huge musicological task annotating old English songs. Three years later, in 1906, as a very strategic action, he asked Holst to compose a piece based on some of the folk songs that he had collected in the region. That’s how A Somerset Rhapsody came to be. Holst decided to create a piece that, to my belief, gives a broad spectrum of what English life means. He chose songs with three different topics and ethos: a pastoral melody, a marching song and a love ballad, to ultimately create an evocative piece of bucolic landscapes, ironic war feeling and melancholic love. Although found in Somerset, not all these melodies were endemic to the region. Many of them came to the county thanks to a centuries-old oral tradition inherited by different tribes of the British Isles, some of them dating back to the Middle Ages and having a Celtic origin. That’s why these old tunes became not a symbol of Somerset, but a landmark of English essence. To me this piece is a reflection of English idiosyncrasy, illustrating a people that finds happiness in the simple and small things of life, and bear in their hearts a melancholic view of the past. Nationalism illustrated through the people’s essence. (Prices quoted are from the Presto Classical website). Contact information can be found on the Contacts page within this web site.